GATOR PROVIDES HIGH COMPRESSIONThe first thing to note about the Gator is that its firm surface and small diameter (about 4.5" or 115mm) produce high compressive forces in the muscle. You'll get as much localized compression as with PVC pipe, but with much less pain or soft tissue damage. You'll also find that the smaller diameter allows you to better work smaller body depressions, such as the arch of your foot or the curve in your neck. Pressing harder and deeper isn't the only way to massage a muscle. Another way to free stuck tissues is to pull them apart. Of course you can't grab the deeper tissue directly, but you can move higher layers of soft tissue to create a separating (shear) force that displaces underlying layers. This approach is often referred to as cross frictional massage. Cross frictional massage is normally done by a massage therapist who uses his thumbs or fingertips to apply short, firm strokes across the muscle fibers. RumbleRoller's Gator is the only foam roller that can grip your skin well enough to mimic this type of massage. INGENIOUS PATENT PENDING TECHNOLOGY. The surface of the Gator contains specially-designed bumps that enable both muscle compression and cross friction. MULTI-DIRECTIONAL MUSCLE THERAPY. With its unique design, the RumbleRoller Gator helps erode trigger points, restore flexibility, and bring quick relief to common types of muscular pain. STRONG IMPACT TO TRANSFORM YOUR BODY. Gator is more beginner-friendly than RumbleRoller's deep-tissue rollers, but don't mistake it for a beginner's roller. The advanced features of this roller benefit even the most experienced athlete. CUTTING-EDGE CONSTRUCTION. 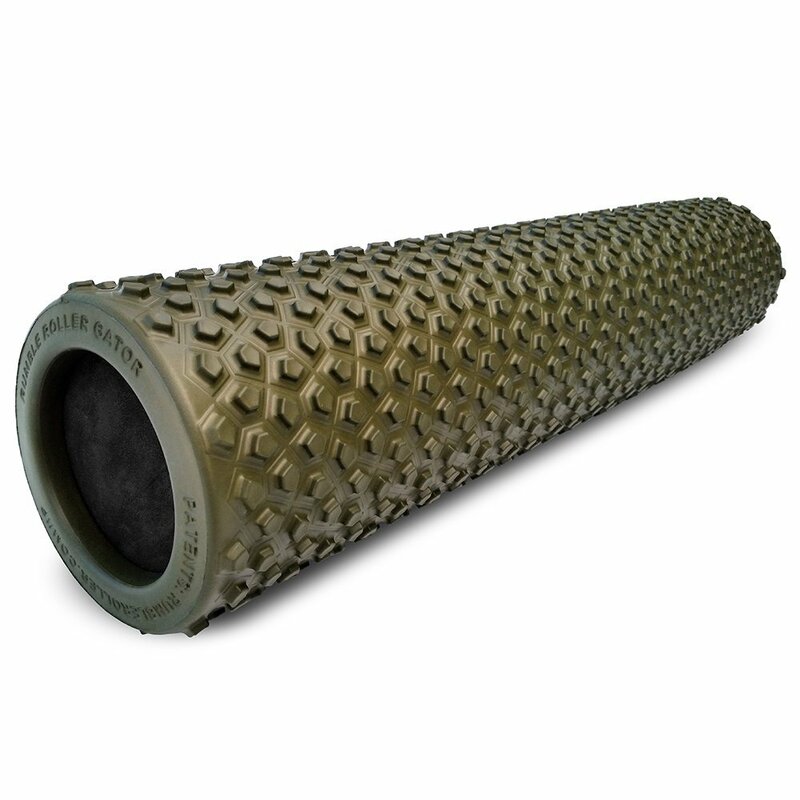 RumbleRoller uses a solid multi-piece core made from very resilient grades of high-density EVA foam. The core and outer shell are both carefully engineered to provide maximum durability and optimal feel. Other manufacturers use hollow cores to reduce costs, but this has a negative effect on a roller's performance and long-term durability. RumbleRoller builds the most effective products that it can, and refuses to cut corners. The center core is made of firm foam rubber. The roller is not soft... but it's not hard either. It's very firm but flexible enough to roll over bony areas without any discomfort. Works great for fascial release and getting out those stubborn knotty areas in the larger muscle groups. "My Physical Therapist highly recommend me to buy this roller. It definitely does not disappoint. Out of all the foam rollers I've tried, only this one really helped me loosen up my fascia. The well shaped bumps along the roller are firm and perfectly spaced and do a great job deeply pressing into skin and muscle. The material screams quality and I can feel results immediately with fewer rolls than other brands. I'll admit, I was on the fence on this item because it was quite pricy, but you definitely get what you pay for. Its the best roller I ever bought and is really helping me with my tight legs and lower back." Testimonial from Lauren J.: "Surprising effective!! Product provides the perfect amount of pressure and hits the right spots without being too aggressive. I was afraid it might not be aggressive enough, but it works wonders! This item has been very successful in helping me rehab my hip and back after three back to back pregnancies. I had several sciatica and my hips kept rotating back and going out of place. Some of the most pains things I’ve ever experienced. I struggled with even walking. My hips would go out at any time with no warning. I am feeling amazing after a few weeks of use and feel like I can start becoming active again. I have missed being active and fit and this has given me the relief I needed to begin!" Can You Rehab a Total Knee in 3 Weeks?